William McNary, co-director of Citizen Action/Illinois, and Gov. Pat Quinn cheered the state's new health-care initiative Tuesday. "We are not going back," McNary said. DOWNTOWN — The governor touted the launch of the state's new health-care marketplace Tuesday. Calling health care "a fundamental right," Gov. 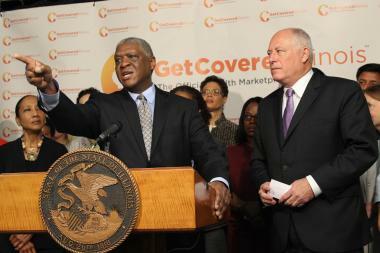 Pat Quinn launched Get Covered Illinois, a campaign to get 300,000 uninsured citizens enrolled in a state-sponsored health marketplace by the end of March. The so-called marketplace or exchange sets up a website where people can get information on plans from eight different insurers and enroll in one of them, sometimes with stipends based on income level. The program is a product of the Affordable Care Act, and in a news conference at the Thompson Center downtown Tuesday Quinn didn't shy from calling it "Obamacare." He chided congressional attempts to delay implementation that have led to a federal government shutdown. "We understand with any new program there will be glitches and bumps along the way," Quinn said. Yet he compared it first to a new Apple product, saying inevitable drawbacks only lead to it being refined, not pulled off the market, and then to a cross-country track meet, saying, "There are no timeouts." "We are not going back," said William McNary, co-director of grassroots group Citizen Action/Illinois, who joined Quinn in celebrating the arrival of health care for all in Illinois. Quinn said universal health care is about getting the uninsured out of emergency rooms, where they drive up health-care costs for all citizens. "You want to be a wellness society," he said. "That's the whole purpose of this." Get Covered Illinois enrollment extends through the end of March, and the health plans actually take effect Jan. 1. Competition mandated as part of the ACA have led to lower insurance rates, according to state officials. "Illinois' health-insurance-plan rates are lower than many other states and 25 percent lower than earlier predictions," said Andrew Boron, director of the state Department of Insurance. "Most people will also get help paying for their plan, and many will be eligible for low-cost or free health coverage." Interested citizens can also call the Get Covered Illinois Help Desk at 866-311-1119. The Emanuel administration announced plans Tuesday to begin a campaign called Enroll Chicago. It will send residents to the Get Covered Illinois website, as well as offer information on the Illinois Health Insurance Exchange opening this month and the Small Business Health Options Program opening in November, along with other health-care options new to the ACA. "The City of Chicago is launching Enroll Chicago to ensure that no eligible residents are left behind as we move forward together toward a fairer future where we live up to our highest values and our deepest obligations," Mayor Rahm Emanuel said. "As the son of a doctor, I believe in increasing access to affordable, quality insurance. The Affordable Care Act will allow many residents to have coverage for the first time in their lives as city agencies and community partners work together to reach uninsured Chicagoans." "It's a grassroots organizing mission," Quinn said, adding that state citizens should get used to hearing about Get Covered Illinois. "I've learned through organizing that repetition and repetition and repetition is a good way to break through and connect with people."